A list of genes obtained from data mining of mouse chromosome 11 were searched against several keywords (phenotypes associated with those regions). 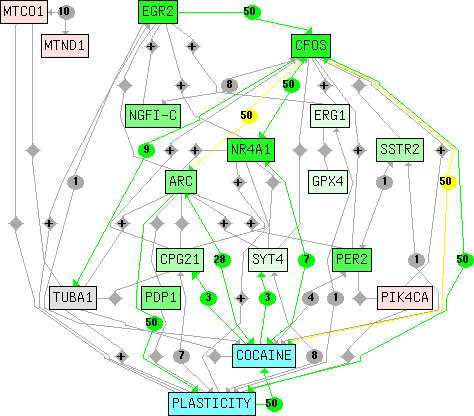 Searching for polymorphism of genes associated with substance abuse or addiction. A list of 27 genes was first identified in a data mining study. This Chilibot search found that the polymorphism of 10 of them were known to be associated with substance abuse/addiction. From a complex of relationship network, Chilibot suggested that CREB may have a relationship (e.g. regulation) with synaptotagmin, based on 1) there is no known relationship between CREB and synaptotagmin; and 2) they are both connected to many gene/protein and are both involved in similar biological process (e.g. LTP). The original search includeed one keyword ("LTP") and 22 other genes. CREB was first selected by clicking on the graph. Hypothesis was generated by clicking on the "CREB might be related to.." button. See here for details.